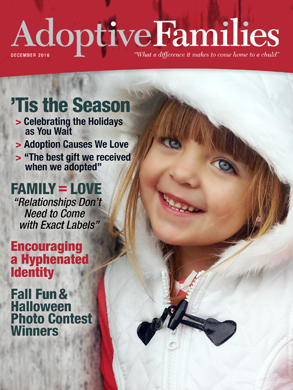 Readers share feedback about articles from the December 2016 issue of Adoptive Families magazine. Beautiful! The author and others raising children in a culture other than their own might want to consider the idea of “third culture kids.” We are Americans and we raised our children in China (one was adopted). Our kids become their own third culture. It’s a blend of cultures and it’s beautiful. It has caused some struggles here and there, but I feel it has made them amazing people with a great world view. Your children are blessed to have this upbringing! While in the waiting process of adopting from Korea, my mother thought I was going a little overboard in obtaining Asian dolls and Korean culture items for our new daughters. After all, she reasoned, they will be raised here as Americans. I told her that I wanted our daughters to have the same pride in being Korean that I’ve always had in my Dutch heritage. While it is wonderful that the mom in the article shares her Indian culture with her adopted children, I do hope she won’t ignore their racial heritage as caucasians and Native Americans. Her family changed when she adopted the twins, because its racial makeup is now made up of all of their identities. This was beautifully written, and a really poignant article for all of us transracial adoptive families. When people ask me about our open adoption experience, I always say (and truly believe), “A child can never have too many people who love him.” I’m grateful for the twists and turns of our family—birth, step, biological, adoptive. We are all family! I have a very different experience with my adoption of three siblings from foster care. My children’s birth mom has mental illness and is angry all the time, their grandmother has a drug addiction, and their birth dad disappeared. It is very open, but so lonely…. One of the most thoughtful gifts we received when we adopted was a homemade pasta dinner. The gift-givers knew we were too focused on the baby and not on ourselves. I have since done the same for my loved ones. I love to give The Family Book, by Todd Parr.